It doesn't sound like much of a battle, but you could soon be very glad to see an ant vs worm showdown. In the never-ending battle to protect computer networks from intruders, security experts are deploying a new defence modeled after the humble ant. Unlike traditional security devices, which are static, the new digital ants wander through computer networks looking for malware such as worms. Current security systems are designed to defend against all known threats at all times, but malware authors keep introducing slight variations to evade computer defenses. As new variations are discovered and updates issued, security programs gobble more resources, antivirus scans take longer and machines run slower. 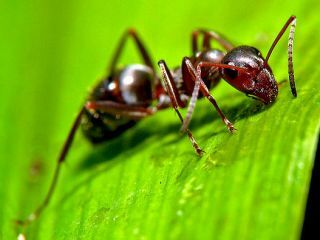 Glenn Fink, a research scientist at Pacific Northwest National Laboratory (PNNL) in Washington, came up with the idea of copying ant behavior. He created a project there this summer that tested a 'swarm intelligence' of digital ants on a network of 64 computers. "Our idea is to deploy 3,000 different types of digital ants, each looking for evidence of a threat," says Professor of Computer Science Errin Fulp. "As they move about the network, they leave digital trails modeled after the scent trails that real ants use to guide other ants. Each time a digital ant identifies some evidence, it is programmed to leave behind a stronger scent. Stronger scent trails attract more ants, producing the swarm that marks a potential computer infection." In the study this summer, the digital ants successfully found a hostile worm. Fulp says the new security approach is best suited for large networks that share many identical machines, such as those found in governments, large corporations and universities. Computer users need not worry that a swarm of digital ants will decide to take up residence in their machine by mistake. Digital ants cannot survive without software 'sentinels' located at each machine, which in turn report to network 'sergeants' monitored by humans, who supervise the colony and maintain ultimate control.